Like these, but you can shower in them. When ya gotta go, ya gotta go no matter where you go. 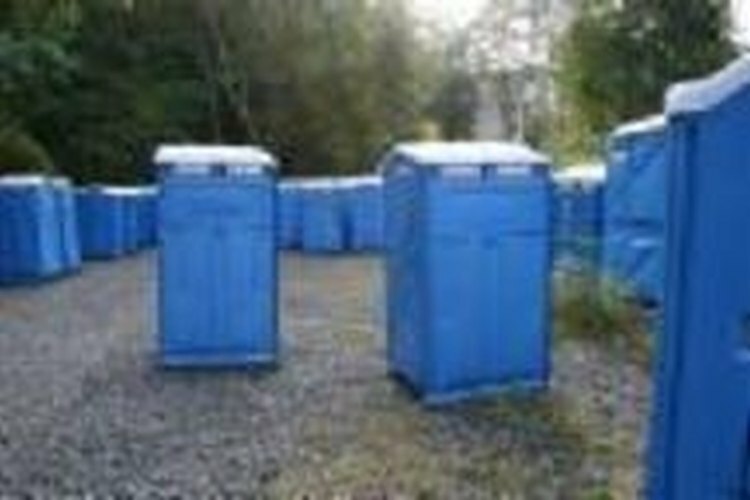 If you're looking to stay tidy in a remote location, you can build your own facility to take care of defecating and take a quick shower. A portable toilet the best way of taking care of urinating when you're away from civilization. Build a metal frame. You want this room to be light so you and a buddy can load it on a truck. It is supposed to be portable. Using wood will make it too heavy. 5x5x7 feet should be a decent size. Build a bench. Build it just big enough to set a toilet seat on. It needs two holes. One under the toilet seat and another smaller hole to run a vent up through the roof. The inside of the bench is actually the holding tank and should be leak proof. The bench needs to be deep enough to reduce the splash factor. Attach the vinyl siding and be sure to add air vents around the top. The siding should also cover the floor board so it is protected from moisture. Drill a hole in the floor and insert a drain that leads to the outside. Attach the roof. It should be slightly slanted for water run-off. Drill two holes in it. One for the toilet vent and one to run a hose line through for the shower. Sand the hole for the hose so there are no rough edges. Buy a shower bag. The shower bag will be placed on the roof to let gravity do it's job. Most marine stores will have them. Attach a stop on the roof so the shower bag doesn't slide off and throw the shower bag up there. I would suggest filling it with water first. Run the hose from the bag through the roof. If it's sunny, that will warm the bag and you will have a warm shower. Attach a door that can lock from the inside. A small window at the top of the door would let some more light than the vents you put in the sides. Spruce it up. Hang a small mirror and add a towel hook. Add a few handles on the outside that can double as steps to make access to the roof easier. You will need to get up there to refill the Shower Bag. You must use a disinfectant in the holding tank. You must have a means to vacuum or drain the holding tank and dispose of the contents properly.